Any hospital or clinic needs to supply its staff properly to ensure the highest quality of patient care. Medical carts are a crucial piece of that puzzle – but it’s easy to overlook details when trying to purchase carts on a tight budget. Point of care carts, medication carts, operating room carts, and other specialized equipment should be selected carefully to suit the needs of your patients and staff. The structure of your medical carts can have a significant impact on staff satisfaction. Aluminum medical carts are lightweight yet sturdy and have a smooth and easy-to-clean surface. Aluminum with powder coating is also available to maximize patient and staff comfort. Often, components that undergo significant stress will be made of stainless steel, but it’s usually not necessary for the entire cart to be stainless steel. Avoid carts with unnecessary surfaces, as these can increase the amount of time required to clean a cart thoroughly. Plastic or painted components on carts can crack and chip, providing breeding grounds for MRSA and other infectious agents. Though some plastic parts are unavoidable, well-designed carts will minimize plastic surfaces. Many designs allow for the cart to be pushed or pulled, maximizing staff mobility in busy hallways and small rooms. Look for carts that minimize their footprint and tuck their drawers and other components into a small area. Busy hospitals want cart batteries that minimize the need to stop and recharge. One solution is the hot-swap system, which allows for new batteries to be inserted without cutting power to the cart’s computer. This system usually features two mounting positions so that a fresh battery can be inserted before removing the old one. Hospitals with plenty of places to plug in a cart may not need a hot-swap system, but very busy nursing staff may appreciate the ability to replace batteries quickly. Some hospitals, though, prefer to rotate out carts and plug them in on a regular basis. Carts featuring Flexible Mobile Cart Power technology (FMCP) maximize mobility and performance flexibility by allowing users to either plug in the cart or swap in a fresh battery as needed. Lithium-ion batteries are the industry standard for safety and reliability, but there are multiple types available, including cobalt dioxide and lithium iron phosphate batteries. Cobalt dioxide lithium-ion batteries are known for their high energy output, while lithium iron phosphate batteries can last for tens of thousands of recharges. Both types can provide several hours on a single charge and can go years without losing charging power. Standard lead-acid batteries require recharging and replacement much more frequently, reducing staff efficiency and increasing costs over time. These batteries are also not hot-swappable and cannot be charged off-cart. 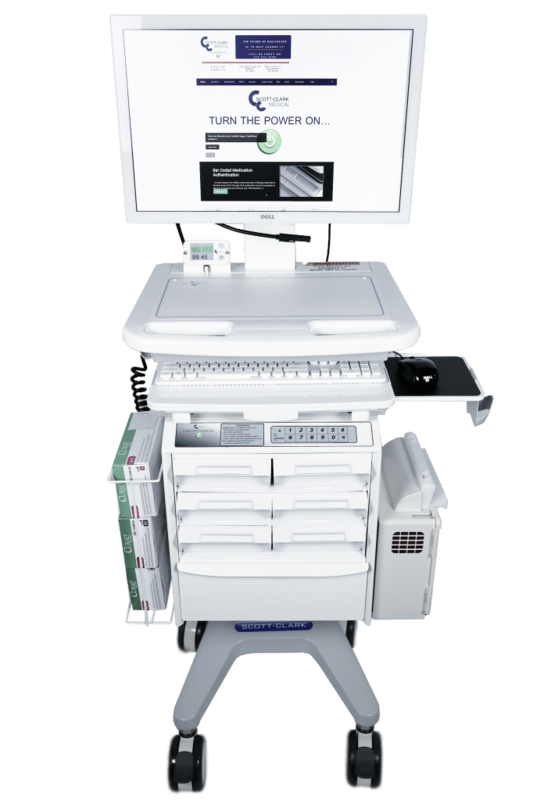 Basic hospital carts are designed for only one computer, but carts for operating rooms need more space for screens and equipment. Fortunately, it’s possible to get custom carts to suit any type of surgery. Large screens and stable cameras are critical for patient safety and successful outcomes when a surgeon needs maximum precision. Make sure screens and cameras are securely attached to the cart and aren’t too top-heavy. Carts with equipment that can be extended into the air should be carefully engineered to keep the center of gravity as low as possible. In our current opioid abuse epidemic, it’s more important than ever that hospitals have the infrastructure to prevent theft of medication. Medication carts with locking drawers are the best option for ensuring proper dispensing. Though manually-locking drawers were once common, modern medical carts often utilize electronic locks. These locks can either require access code or proximity cards to open. For busy facilities with many passcodes to keep track of, proximity cards may be a better option. Height-adjustable carts are a must for any hospital. Back injuries can occur when staff slouch or crane their necks to use equipment, and even patients can lose out if they can’t see an ultrasound screen or another monitoring device. Most heavy carts will need handles of some kind, and ergonomically-designed handles will reduce repetitive-motion injuries in nursing staff. In a medical emergency, hospital staff’s ability to maneuver a crash cart can dramatically affect patient outcomes. Look for carts with wheels that rotate easily and don’t stick out beyond the top of the cart. When a nurse is rushing down a hallway, the last thing they need is for a wheel to get caught on a doorframe. Fasteners should also be unobtrusive since poorly-designed fasteners can snag on clothing or even cause damage to other equipment. A well-engineered cart will have rounded bolts or screws that are flush with the surfaces being joined. Ultimately, consulting with your physicians, nursing staff and IT department should help you decide which systems are right for you. Medical carts are an investment that should last for years and should be able to be retrofitted as new technology emerges.